Can this hamster achieve his lifelong dream? Hugo is a hamster (one who, as pictured, sits in chairs, reads books, and eats chocolate-chip cookies). While he is “helpful, polite, generous, a great cook, a fast runner, a slow eater, and a fantastic dancer,” he is not “strong, tall, able to sing, or particularly good at bowling.” And he is not, despite a passion for helping others and a lifelong interest in fighting fires, a firefighter. 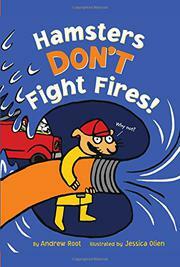 Though it might be difficult, Hugo isn’t too afraid to try—and prove that maybe hamsters do fight fires. Like the many other stories in which animals aspire to do unbelievable things (commonly dance but also jump, fly, or befriend their natural prey), Hugo’s tale aims to inspire children to recognize their strengths and defy expectations. This telling requires a little extra suspension of disbelief, as Root’s text and Olien’s boldly colored digital illustrations feature a good dose of the absurd. Hugo’s friend Scarlett is a snake, and the climactic moment finds Hugo carrying a baby bird of his size (although this is not actually shown in the illustrations, perhaps because it might just be too absurd). Hugo, despite many positive qualities, is not an especially endearing hero, with his bulging eyes and long furry limbs belying an actual hamster’s rotund appeal.